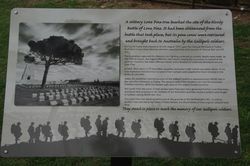 The pine tree commemorates Australian and New Zealand soldiers who fought at Gallipoli during World War One. A solitary Lone Pine tree marked the site of the bloody Battle of Lone Pine. It had been obliterated from the battle that took place, but its pine cones were retrieved and brought back to Australia by the Gallipoli soldiers. During the battle that ensued on the 6th August 1915 upon the Gallipoli Peninsula in Turkey, Australian troops drew Ottoman attention away from the main assaults at Chunuk Bair and Hill 971. The Australians captured the Ottomans but fighting continued as counter attacks were made. By the 10th August, the August offensive had ceased, leaving the Australians in control of the position. However, the wider offensive failed, and a situation of stalemate developed around Lone Pine. In total, there were 2,277 Australian casualties and some 5,000 Turkish casualties. 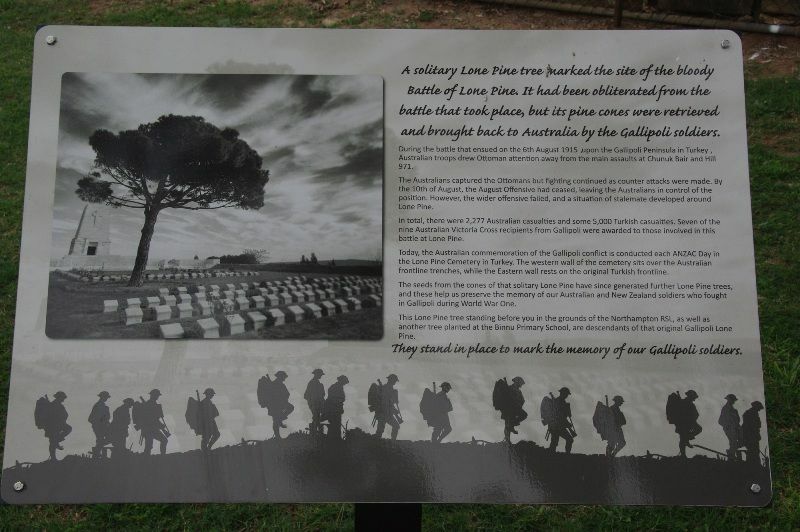 Seven of the nine Australian Victoria Cross recipients from Gallipoli were awarded to those involved in this battle at Lone Pine. Today, the Australian commemoration of the Gallipoli conflict is conducted each ANZAC Day in the Lone Pine Cemetery in Turkey. The western wall of the cemetery sits over Australian frontline trenches, while the eastern wall rests on the original Turkish frontline. The seeds from the cones of that solitary Lone Pine have since generated further Lone Pine trees, and these help us preserve the memory of our Australian and New Zealand soldiers who fought in Gallipoli during World War One. 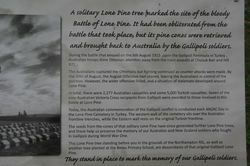 This Lone Pine tree standing before you in the grounds of the Northampton RSL, as well as another tree planted at Binnu Primary School, are descendants of the original Gallipoli Lone Pine. They stand in place to mark the memory of our Gallipoli soldiers.